Varanopids (Fig. 1) are those vaguely monitor-like basal synapsids, that are the plain brown sparrows of the clade. Yet from them arise the spectacular pelycosaurs and the less spectacular, but no less important, basal diapsids, according to the large reptile tree. Figure 1. 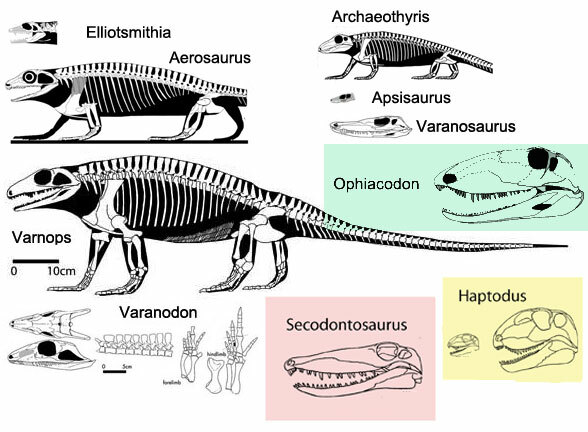 On the left, varanopids according to the large reptile tree: Elliotsmithia, Aerosaurus, Varanops and Varanodon. On the right, non-varanopids: Archaeothyris, Apsisaurus, Varanosaurus, Ophiacodon, Secodontosaurus and Haptodus. Secodontosaurus appears to be close to Varanosaurus. As much as Secodontosaurus looks like Varanosaurus, they are not related. But evidently the genetic material was present as this represents a reversal to earlier morphologies following Haptodus as a direct ancestor. The problem among paleontologists has been and continues to be: they never add basal diapsids to their inclusion sets. So they don’t know this varanopid-diapsid relationship exists. In the large reptile tree, some varanopids nest within the clade synapsida. Others do not. They are basal to diapsids, so they are called proto-diapsids. Elliotsmithia, Aerosaurus, Varanodon and Varanops form a basal synapsid clade. Then Apsisaurus, Varanosaurus and Ophiacodon, followed by the sailbacks and therapsids. Varanopidae: Apsisaurus, Archaeovenator, Varanosaurus and others. Subfamily-Varanopinae: Aerosaurus, Varanodon, Varanops and others. Tomorrow and the next day we’ll look at proto-synapsids and proto-diapsids to scale. This entry was posted in varanopids and tagged varanopids by davidpeters1954. Bookmark the permalink.